Field Projects, is pleased to present HANDS ON, a solo show by Karen Lederer that wrestles with the patriarchal canon of the past while confronting the current administration's fever pitch war on women. Using techniques and materials ranging from pop colored inks, gradient monoprinting, loose watercolors, acrylic paint, crayon, and sharpie crosshatching, Lederer creates images that walk the line between wry playfulness, and deep-seated fears, all the while deconstructing the picture plane and drawing parallels between the digital and the analog. In HANDS ON there are three bodies of work that mix and play along the walls. 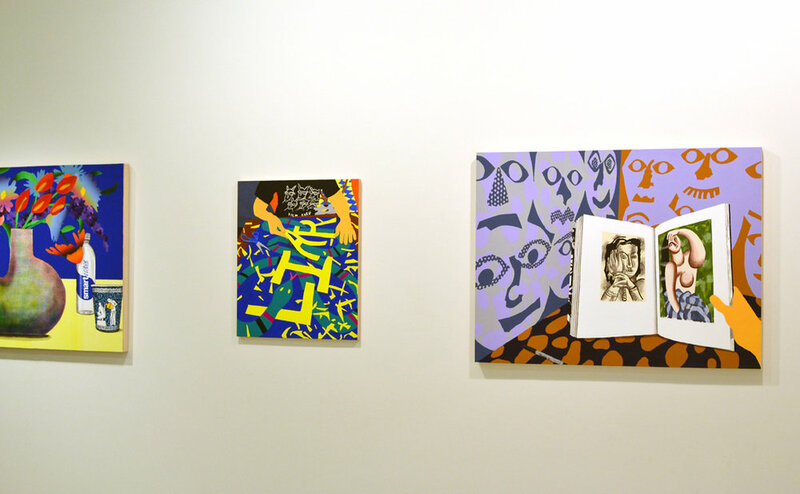 First is Lederer’s long standing practice of depicting her own artist studio life through POV paintings, such as in Face Off, 2017, where the artists’ hand, armed with scissors, inserts itself between the pages of nudes by Matisse and Picasso. All the while, snake motifs coil in battle on a background of blown-up abstracted pattern. Is she paying homage to these canons, inserting herself into history, or simply collaging on top of these titans? Perhaps it’s all the above. Her second body of work is composed of still life’s which include bodega snacks and paper cups, friendly studio plants often trying to unlock bottled water, museum shop trinkets, lonely fish trapped in bowls or bags and a myriad of other playful metaphors of the human condition. The third is a new body of work where Lederer has fully entered the pictorial plane. This work questions how one represent themselves here and now, and in representing oneself, how does one portray an honest, and accurate depiction in a world of selfie curation. 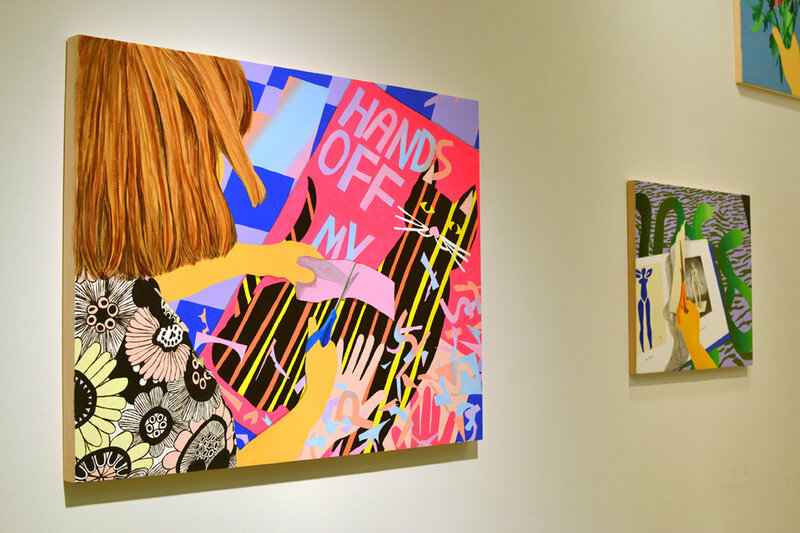 Armed once again with scissors in Hands Off, 2017, and Snake Oil, 2017, Lederer reveals herself in the process of creating protest signs in the style of her paintings. Lederer’s body and political participation is now center stage. Each body of work has its own agenda but they all play with the formal processes of the pictorial plane. Laying photorealistic renderings next to jarring colored gradient effects disorients the intimacy of the scenes. This is also compounded by the use of textures and volumes, which flatten when they should bulge and oscillate between symbolism and illustration. There is always a horizon line to anchor us but it is unclear whether we are in a videogame or a Cezanne. Karen Lederer (New York, NY) received her BFA in Printmaking and Drawing from the Sam Fox School of Fine Art and Design at Washington University in St. Louis in 2008 and an MFA in Printmaking from Rhode Island School of Design in 2012. She was recently a SIP Award recipient from the Robert Blackburn Printmaking Workshop Program at The Elizabeth Foundation for the Arts. She is currently an artist in residence at the Keyholder Residency Program at the Lower East Side Printshop. 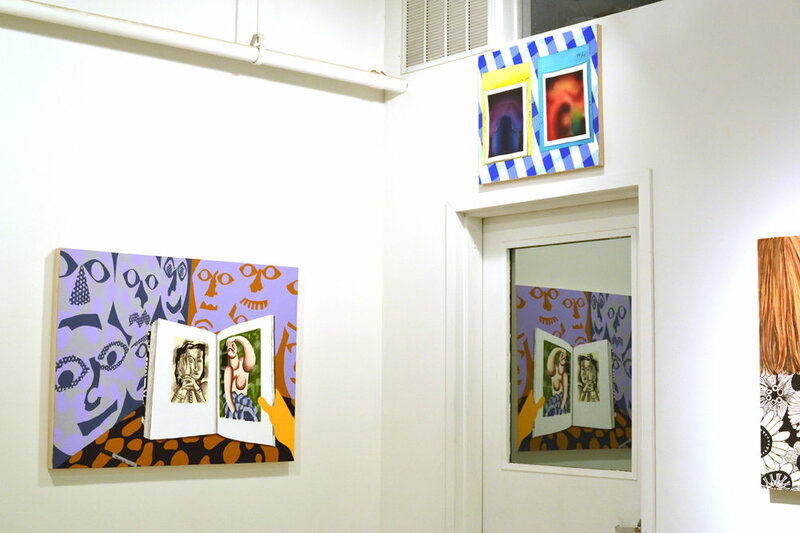 Lederer has recently exhibited at Danese/Corey, Driscoll Babcock, International Print Center New York, Cuevas Tilleard, and The Wythe Hotel. She currently works out of a studio provided by the Sharpe Walentas Studio Program in Dumbo, Brooklyn. Karen will be hosting a poster making day at Field Projects.